There were many losers at the recently concluded 27th African Union (AU) summit in Kigali. The three candidates for the post of AU commission (AUC) chairperson could be counted among those, since none of them got enough votes to succeed the outgoing chairperson, Nkosazana Dlamini Zuma. As a result, the candidates’ presidents – Yoweri Museveni of Uganda, Teodoro Obiang Nguema from Equatorial Guinea and Botswana’s president Ian Khama (although absent from the summit) – certainly didn’t look good either. However, one of the clear heroes of the summit is former African Development Bank (AfDB) chief, Donald Kaberuka. After stepping down at the AfDB last year, Kaberuka was tasked with looking into the financing of the AU, and especially the establishment of a Peace Fund for AU peacekeeping operations. As Rwanda’s former finance minister, he seemed to be the right man for the job. The fact that over 70% of the AU Commission is funded by outside donors hangs like a sword over the organisation. Its independence and honour are at stake. Kaberuka came up with a plan in a fairly short space of time, and its adoption at the summit was hailed as ‘historic’. In short, his strategy is to secure financing for the AU through a 0.2% levy on imports to African countries. This should enable AU member states to fully fund the functioning of the AU Commission and to cover 75% of programmes – as pledged by AU leaders at the summit in Sandton last year. AU Chairperson Idriss Déby said the decision on financing was the most important of the summit. ‘For the first time, the continent is taking charge of its own destiny,’ he said. Déby added that the plan would put an end to the ‘frustrating and troublesome dependency on outside financing’. Speaking to the media at the summit, Rwanda’s current finance minister, Claver Gatete, said the levy would be able to generate U$1.2 billion – far more than the AUC budget for 2016 of US$447 million and even its 2017 budget of US$782 million. In addition, each region would also be asked to contribute US$65 million from the import levy for the Peace Fund. If all goes according to plan, this would secure AU financing to fulfil the obligation of covering 25% of peacekeeping operations in Africa. If this can be achieved, the so-called ‘Obama plan’ for the United Nations to fund the other 75% from assessed UN contributions should kick in. Peace and Security Commissioner Smaïl Chergui is especially happy about this, and said at the summit that he would be travelling to New York straight away to discuss this new development with the UN. But will it work? Similar plans have previously been presented to AU member states; including a levy on flights or hotel occupations – a plan put forward by former Nigerian president, Olusegun Obasanjo. These were, however, not accepted as such by heads of state, but rather presented to countries as ways in which they could finance their assessed contributions to the AU. Implementing the new plan could be an immense administrative feat, especially since certain products – like medicines and fertiliser – would be excluded from the levy. Who would be charged with drawing up these lists? Gatete told journalists that administrating the fund wouldn’t be a problem since the levy would be channelled directly from revenue authorities to the treasury. It wouldn’t figure in the budgets of the countries, so it wouldn’t have the same impact as financing AU membership through regular channels. ‘The new formula is simple and automatic and doesn’t pose any budgetary constraints,’ Gatete said. He also argued that some regions, like the Economic Commission for West African States, have already implemented a similar levy to finance its commission. This shows that it can be done. The second obstacle is ensuring transparency and compliance. According to him, a committee of finance ministers will be charged to oversee the process and check compliance. ‘The decision of heads of state is binding on all countries,’ he said. Would this be enough? The AU is already very reluctant to name and shame those who don’t pay their dues. In theory, sanctions kick in after a country has defaulted twice on its annual contributions, and these countries are not allowed to vote on AU decisions like the election of the new AUC chairperson. However, the AU is very tight-lipped about the list of states that have been sanctioned in this way. Finally, another major sticking point of the plan is the short timeframe identified for its implementation. Heads of state seem set on having it in place by 2017. Will the AU become financially independent in one fell swoop? At the summit, Kaberuka was asked whether his plan was not too ambitious. ‘No,’ he said. He believes that because Africa is already organised into a number of free-trade zones, this can very easily be implemented by next year. The AU is notorious for setting tight deadlines. A few years ago the AU leaders also set a target date of 2017 for a full continental free-trade zone. This hasn’t happened yet. 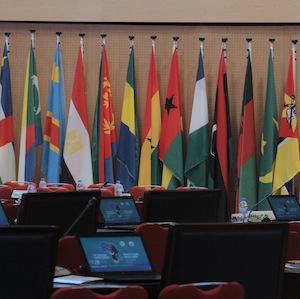 At the Kigali summit, the chairperson of the AUC revealed the new AU passport, which would allow its holders to travel freely across the continent. A deadline was set for implementation by all African countries by 2020. This is an extremely contentious issue that touches on the sovereignty of states to decide who can and can’t cross their borders visa-free; and this also seems like a very short deadline. Clearly, it was important for the AU leaders to show the continent and its international donors that a bold decision has been taken on financing, and that it will be speedily implemented. This was all the more pertinent since outside partners and donors were not invited to attend the Kigali summit. The organisers justified this by saying the many side meetings with observers at summits derail the decision-making at these high-level gatherings. If the AU were totally self-funded, the relationship with partners and donors would change radically. While Kaberuka should be congratulated for presenting a plan that received the unanimous support of member states, the outgoing chairperson of the AUC also made self-financing a priority during her term in office. If the plan were to be implemented, Dlamini Zuma could tick that off as one of her achievements at the AU. Anton du Plessis, Executive Director at the Institute for Security Studies’ cautions that she should not use this potential self-funding success to sideline traditional AU donors, as these partners will remain vital to the AU moving forward. Dlamini Zuma has been criticised during her term for being anti-Western – in line with the stance taken by former South African president, Thabo Mbeki. In addition, Du Plessis says it is important to know that a more predictable revenue stream is not the panacea for many of the AU’s problems, especially not when it comes to dealing with crises like South Sudan. ‘Real political will is more important than money,’ he said. ‘Hopefully this funding commitment is a positive sign in this regard’.